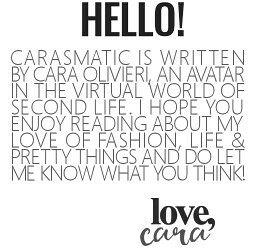 Cara Olivieri is the sole author of Carasmatic. I will also never ask for review copies. If anyone claiming to represent me or my blog asks for review copies, please inform me right away. Do I accept blogger and review copies? Yes I do, and for all designers and creators who do send review copies, thank you so much for your support. 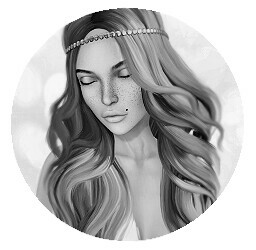 I will do the very best that I can to showcase what fits most into my taste and style, but please keep in mind that between RL and the never-ending entourage of events in SL, I won’t be able to blog everything sent to me. I am not a critic. While I do write about some of the items I blog, please keep in mind that I only generally blog items that I like and what fits most into my style. If I blog an item, I may or may not say anything about it, but I will always photograph it to the best of my ability. Any items that do receive direct review are at my discretion and represent my most honest opinion. All credits and SLurls of stores and events will be listed. When sending an item, I ask that you please include any relevant landmarks and information pertaining to the item. Group blogging. I will fill out applications and forms for creators and events I know to meet my style and which I know I can commit to. Residents are welcome to send me links to applications, or information pertaining to a blogger opening, but please keep in mind that I can only accept positions whose requirements I know I can meet.